The first thing to do when making ham potato casserole is to dice the ham, slice the potatoes (a mandolin makes it quick and easy), and dice the onion. Also preheat your oven (325° for a glass baking dish, 350° for metal). Once those are ready, start building the layers. 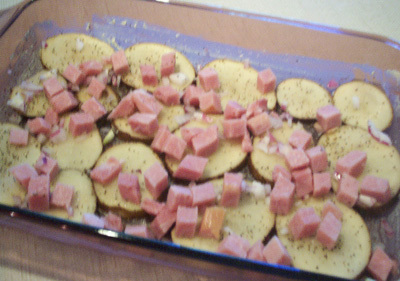 Potatoes first, onion, pepper, ham and a few dabs of butter per layer. The last layer is potatoes. Before you add pepper at this point, pour in the milk until it reaches halfway up the sides of your dish. 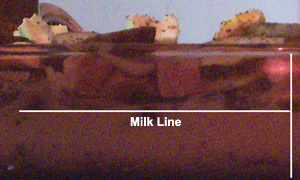 (It’s a bit difficult to see in this picture so I drew a Milk-Level line for clarity.) Now you can place some more dabs of butter and sprinkle pepper on top, otherwise you’d wash the pepper down with the milk. Tip: We like our ham potato casserole on the peppery side, slightly spicy. If you don’t like this much pepper, don’t use it on every layer and sprinkle lightly. 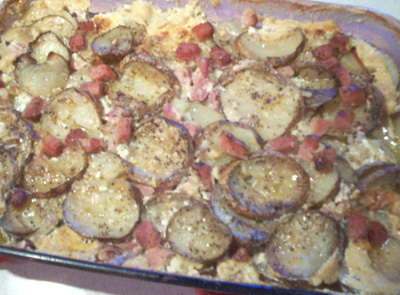 Remove the foil covering the ham potato casserole after about 50 minutes of baking. Note: Since these pictures were taken, we’ve cut back on the amount of butter we use. We love the taste of butter and it’s healthier than margarine. In fact, if you put an open container of margarine outside, bugs or flies won’t touch it! That says a lot! Besides, the closer a food substance is to natural, the better it is for you than anything processed. So I use butter, not margarine! 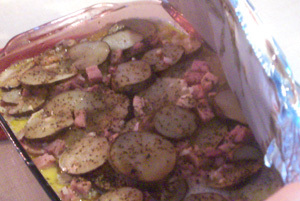 This ham potato casserole is still delicious with less butter. Cover the baking dish with aluminum foil and bake at 325° for a glass dish (otherwise 350°) for 50 minutes. Remove the aluminum foil and continue to cook until the top is as brown as you would like it. (We like the top potatoes on the crunchy side.) Notice how most of the milk has been absorbed when it’s done. I don’t add any salt, but Dan always adds it on the plate. One of the best ways to get healthier meals is to omit salt (or at least greatly reduce its use) in any recipe you can without affecting the overall flavor. 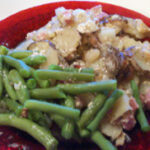 This ham potato casserole is one that works well without salt. 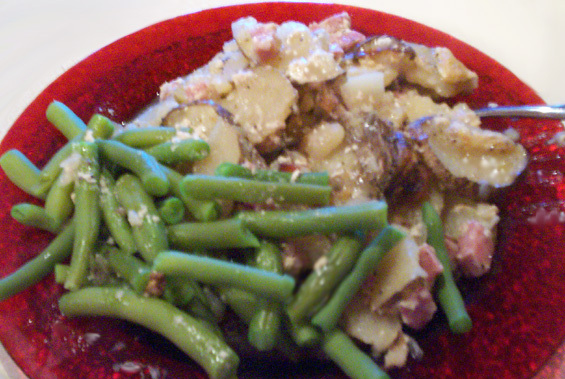 with fresh picked green beans.